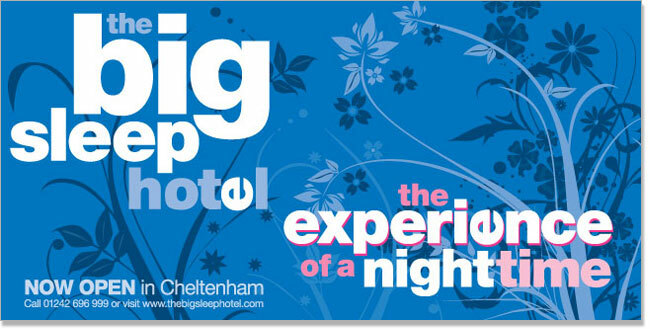 The Big Sleep project was an interesting one for me, which involved taking a pre-established logo and colour pallette to create a new, refreshed identity for the brand to coincide with the opening of a new hotel in Cheltenham. The client described their hotels as 'budget designer', offering boutique-style rooms with a strong sense of style and fun at reasonable prices. After seeing the rooms themselves and getting a taste for the experience, I developed this solution to give the feel of 'wallpaper, but with a twist'. The result was a quick and cost-effective identity that ties in nicely with the customer experience. A bit of creativity in the straplines added humour, and also laid the path to building a well-received launch campaign for the new hotel. 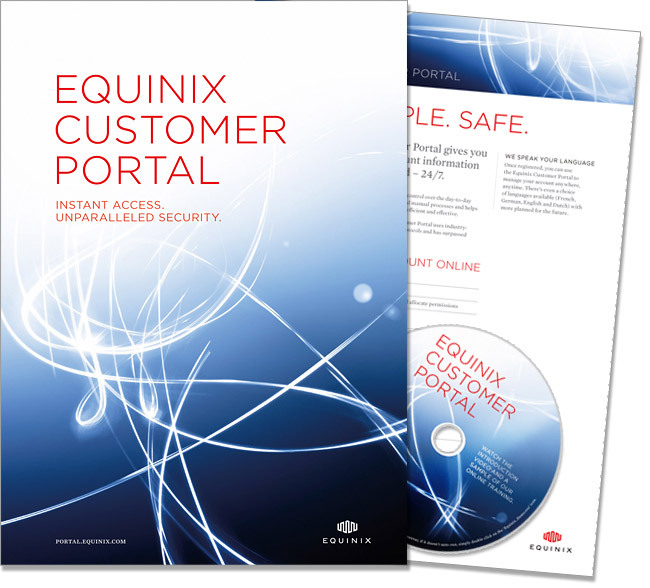 Equinix is probably the biggest company you never heard of – essentially they provide high-end datacentres for hosting and exchanges (the 'real world' parts of the internet! With a large corporate presence in America, Europe and the rest of the world they also have the strength of brand you would expect. So it was exciting to get the chance to develop a new branch for their new customer-facing service. 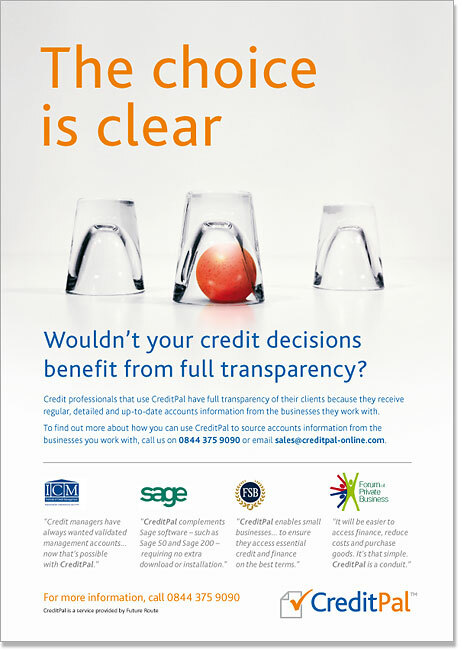 Using a new combination of existing corporate colour palette and typographic elements, I also introduced a consistent abstract image scheme to create a lighter, more approachable and dynamic style which stood apart from the company's usual corporate style of black and red while still sitting comfortably within the wider brand. Sometimes a new brand needs more than just a nice logo. When Relyon launched a new product line of luxury mattresses, they wanted to distinguish the new memory foam materials used from their core business of traditional matresses while engaging a wider, younger market. Focusing on the core benefits of the product, we created an identity for the range that sold the life-enhancing benefits of a good night's sleep against the subtext of the all-natural materials used in the manufacturing process. 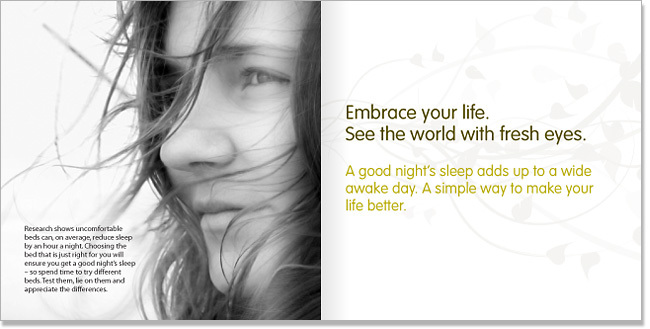 The image above is a spread from a concept book giveaway which was displayed alonside the product to introduce these benefits to the public. As a campaign, this was a fresh approach both in terms of the message and the marketing materials produced in a two-pronged strategy aimed at consumers and retailers, and helped Relyon to quickly establish their product in a competitive market. 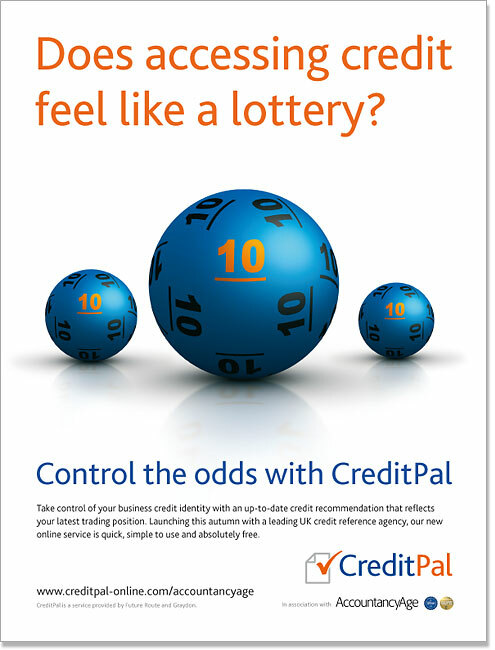 What made this a particularly interesting project for me was the opportunity to do some really creative copywriting which became central to the proposition of the product campaign and ran across several pieces. 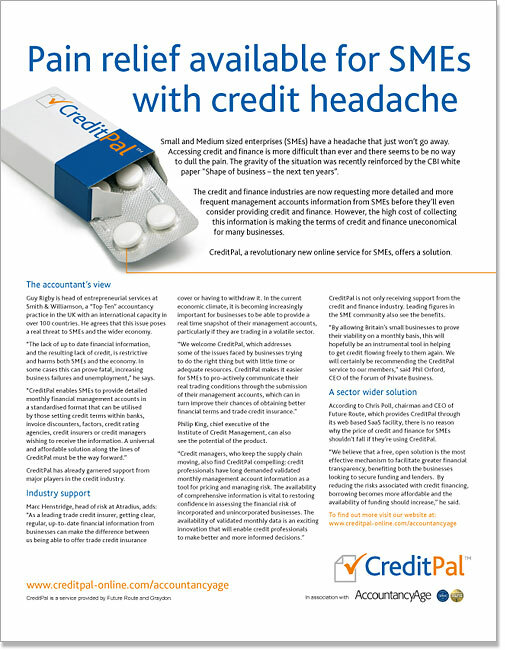 When Future Route, a company specialising in financial software solutions, was developing its newCreditPal service, we were called in to create an identity for the product – the main part of this was seen to be the development of a new logo. 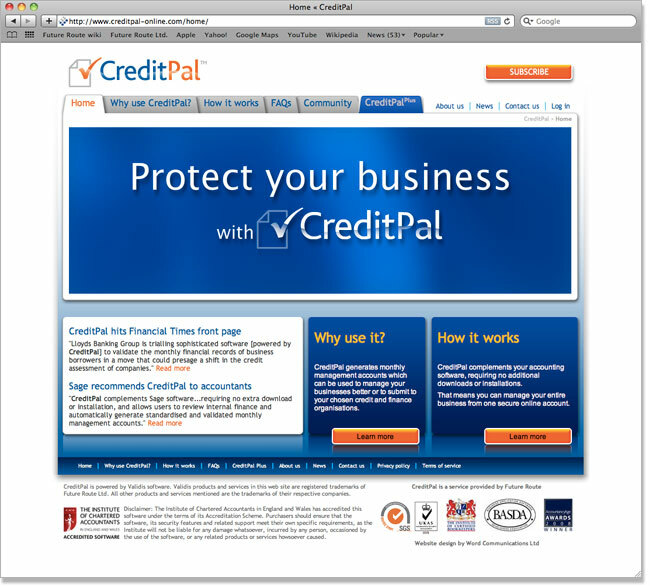 Working from the pre-existing company colours of orange and blue, I also took the main company logo font as a basis to create a compatible logo for CreditPal. You don't have to be 'big' to have good design. 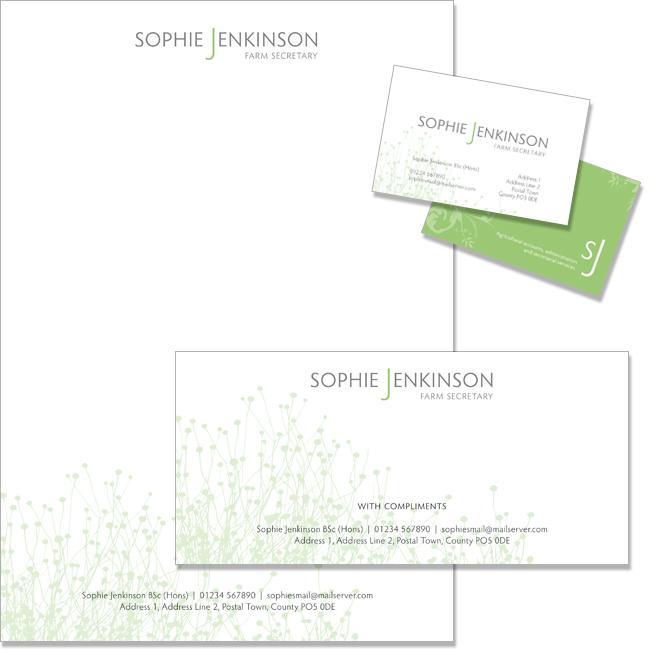 When Sophie Jenkinson wanted a logo and some stationery for her small business I was given a detailed brief but a fairly free hand with how that was interpreted to the final product. Here, a simple yet elegant typographic treatment combined with a soft "meadow" watermark makes for a nice set of stationery that sets her apart from the crowd. This has all been really well received by the people she works with, I've already had a couple of good referrals as a result of the extra effort! Updating the logo was just the beginning for this project. 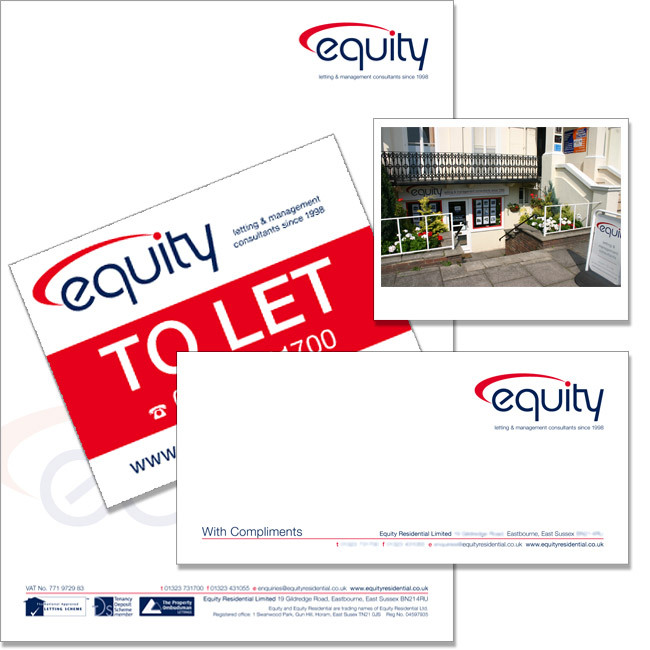 After 13 years in business, this Lettings agency was treated to a new set of salesboards, stationery and even a shop sign and storefront redecoration with red-framed windows to draw the customers in! The combined result of a clean, bright logo with considered application gives the company a much more professional and positive outlook. Recently, I also built their new website, which you can see here. A brand-new company, Easi-Style had already had some work done on their branding while they get their product ready to launch, but it still needed revising to acheive the 'classic contemporary' look they wanted. Working from their existing style (as part of the brief I had to keep the colours and elipse elements) I eventually produced this typographic solution which updated their look without losing the core style they had invested in already. As an extension to the work on their logo I also re-worked the packaging for their soon-to-be-released DVD and am currently in the process of building a website (there's a sneak preview shown above). 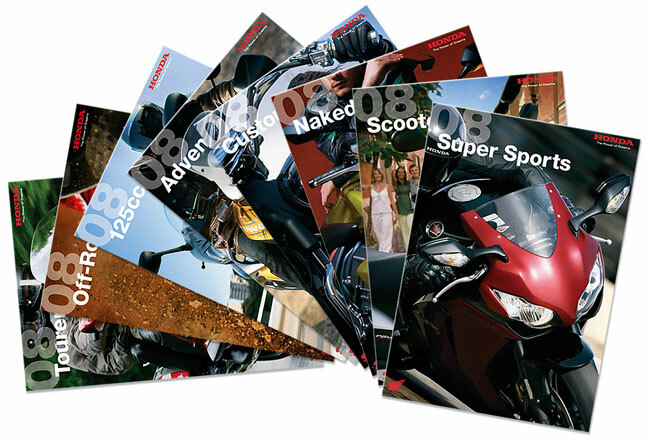 During my time working with Impact Design and Marketing, I worked across four yearly cycles for Honda (Europe) Motorcycles to produce their range and model-specific product literature – printed and distributed in seven different languages across fifteen countries! Challenges (apart from the scale of the whole project) included producing solutions that take into account the needs of often very different cultural or commercial attitudes across regions, and developing a set of coherent designs that would adapt to different weight of content per language. 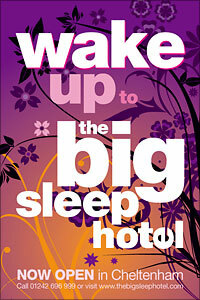 My own involvement ran from concept / pitch documents through design and development, artworking and image retouching. It was an interesting challenge as at different stages in the production cycle my role would change and, each year, we would try to bring something new to the brand in order to park a point of difference in a very competitive market. 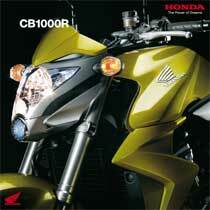 This product launch advertisement (national press) for the new CB1000R was designed specifically fior the UK market. We were asked to create an ad that was "as minimal as possible... just show how cool and mean the bike looks". Following a team brainstorm 3-4 ideas were sketched out for review by the client. The linework sketch in the corner above shows the winning concept in its original form, with the strapline "Admire the beauty... Unleash the beast" to illustrate the mix of style and power. We later stripped this back even further both in copy and image to what you see in the main image. 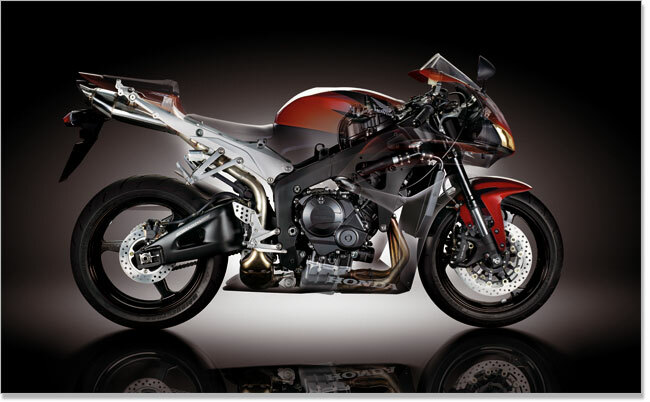 Here, the simplicity of the idea is offset by extra attention in the photoshop to give the bike an almost jewel-like feel. 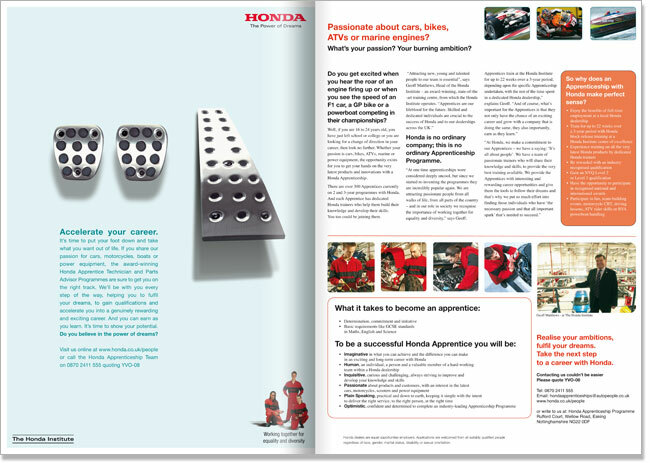 Reaching out to a new audience was the aim of this series of advertisements for the Honda (UK) Institute, Honda's training centre for mechanics and engineers. As part of a drive to engage potential recruits from poor/inner-city backgrounds and to encourage more women into the industry, these ran in magazines outside the normal industry press. The concept was to create icons (in the style of Honda ads of the time) that were aspirational yet attainable – what does the audience want from life? For young men we used the line "Accelerate your career", alongside the 'icon' of sports car pedals and a promise of a job with prospects and respect. 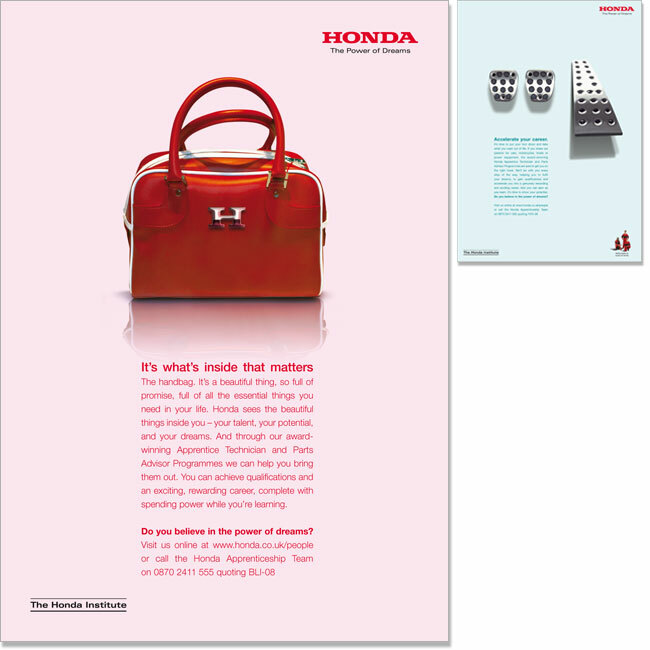 For the girls, it was an everyday object of desire and status, a handbag, with the line "It's what's inside that counts" showing that if they had the talent Honda could help to bring it out in an environment of equality. Large-format advertising layouts were placed on roadside boards and bus-backs in this London-based campaign to raise awareness of the benefits of commuting on a scooter. Following a pretty loose brief from the client I went through the studio archives and found some old rejected copy lines which I reworked into what you see here. 'Scooters for London' was an alliance of the main (Honda) scooter and motorcycle dealerships across the capital, looking to boost sales with a relatively high-profile campaign which could run and develop over a year. Based around the campaign strapline of "There is a better way" we directly targeted the frustrated commuter stuck in traffic, playing on the little frustrations of the journey they currently experienced (getting the anti-bus mesage right for the back of a bus was a challenge, but somehow we got away with it!). The campaign was also developed to a series of template advertisements for use by individual dealerships. Corporate brochure design for Future Route. 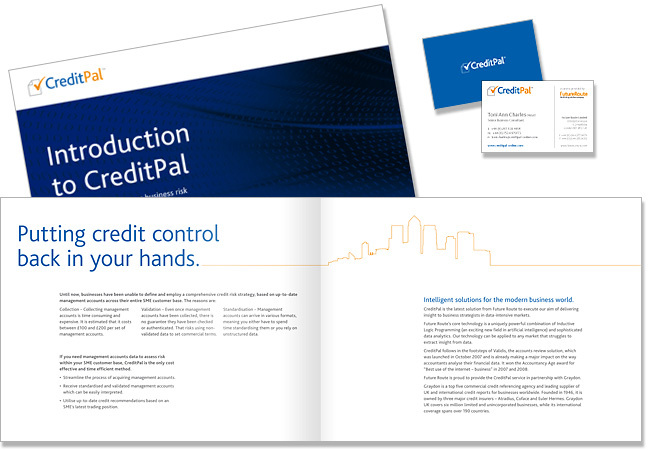 This brochure was used primarily as a pre-meeting sales tool in pitch situations as the company sought to build business partnerships with large corporate players in the banking and credit sectors. The primary aim therefore was to further build on the branding of the product to present a clear, professional design that would reassure prospective clients/partners, and also clearly explain what the product is and what benefits it product has to offer. 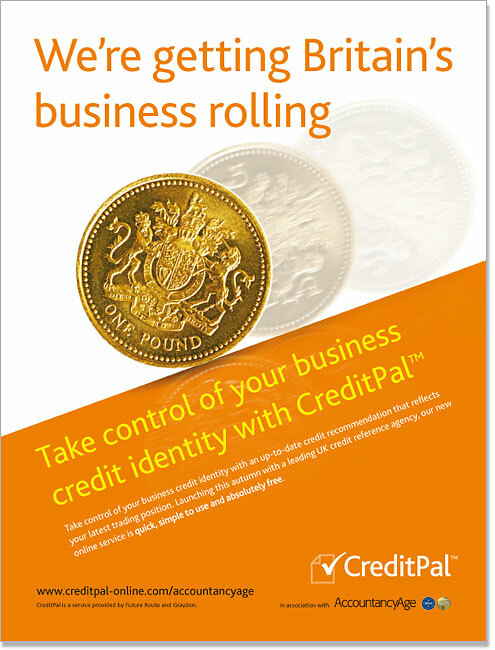 As part of the CreditPal product launch, we were asked to create a campaign of advertisements to appear both in print and on the web. This sequence shows (in chronological order) the press ads to date. 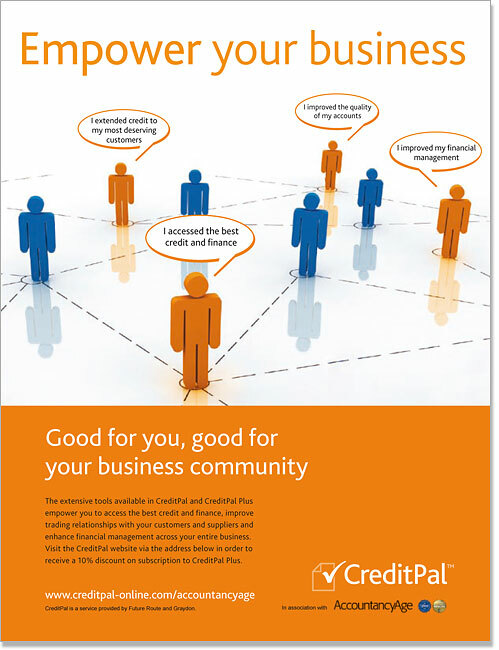 CreditPal has changed a lot as a proposition as its company learns more about the market requirements and has evolved to meet those needs. This is reflected in the style of the ads, which began as a freindly, optimistic reaction to the credit crunch of 2009, aimed at SMEs, and are gradually moving to be more corporate in style as partnerships are formed with large banks and corporate trading partners. 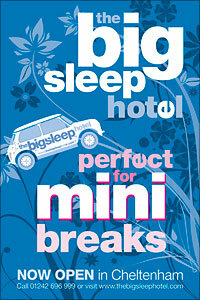 Corporate clients often have well-established brand identities, and a firm set of rules to consider in any new design. Working to guidelines, setting up working layout grids and master style sheets... it's all part of the technical challenge of the job and still something I very much enjoy! 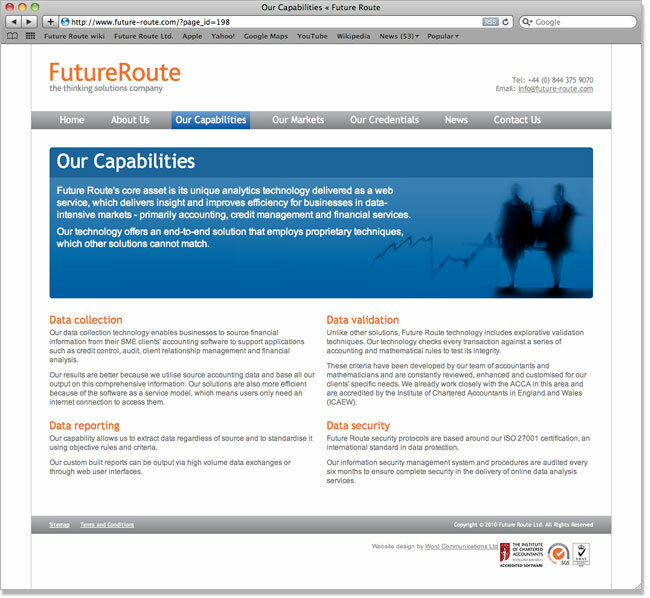 This corporate website for Future Route was designed purely as the 'shop window' for the company. 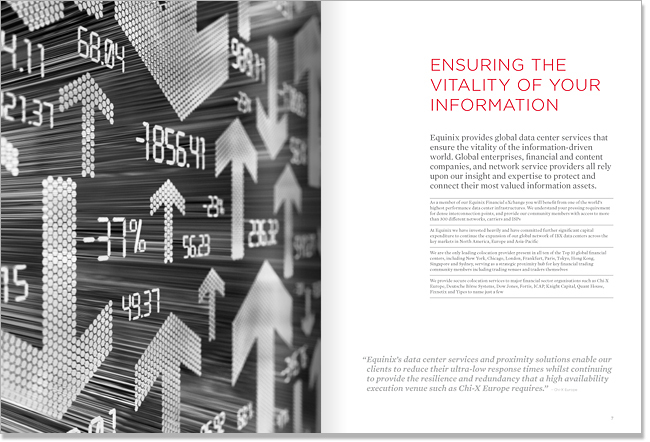 Dealing primarily with large corporate and banking-sector partners, the priority was to create a crisp, businesslike feel that delivers its relatively complex information in a heirarchy of headline bullt-points followed by more detail in the lower sections of each page. I worked with junior designers and a team of developers to deliver the site on the WordPress platform, this enables the client to keep the content current as their business progresses. Custom-built WordPress templates were built for this website, which breaks down a complicated concept with a lot of in-depth information to bite-sized sections aimed at an audience of SMEs and accountants. Whereas the easy route would have been to adapt an 'off-the-shelf' design, we felt this product needed to stand apart from the crowd, and that the design needed to be led primarily by the structure of the information. Leading on design and overall site structure, I worked with a team of developers to deliver the final product. Everything on the website is led by heirarchy of inromation, from the split-level navigation bar to the secondary page sections which help lead the user around the site. Brand colours are used to good effect, with a blue-white base accented by clear entry and exit points in orange. Synergy with the 'parent' Future Route website is maintained via consistent typography and spacing of elements. 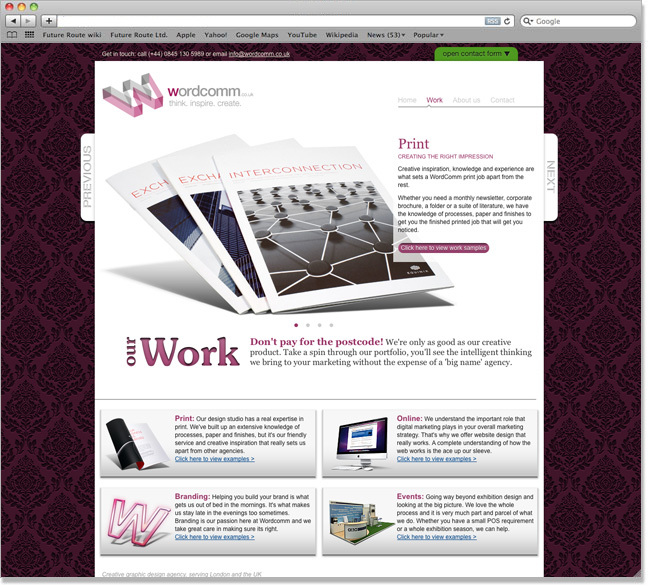 One of my main clients, Wordcomm are a full-service design agency offering design for print, online, exhibition/events and branding. Since working freelance the majority of my work has been for this company as their consultant Senior Creative, where I've also manged other designers within the studio. For the website (to coincide with a rebrand) the brief was to produce something that would set the agency apart from the crowd, without upsetting their largely corporate client base. 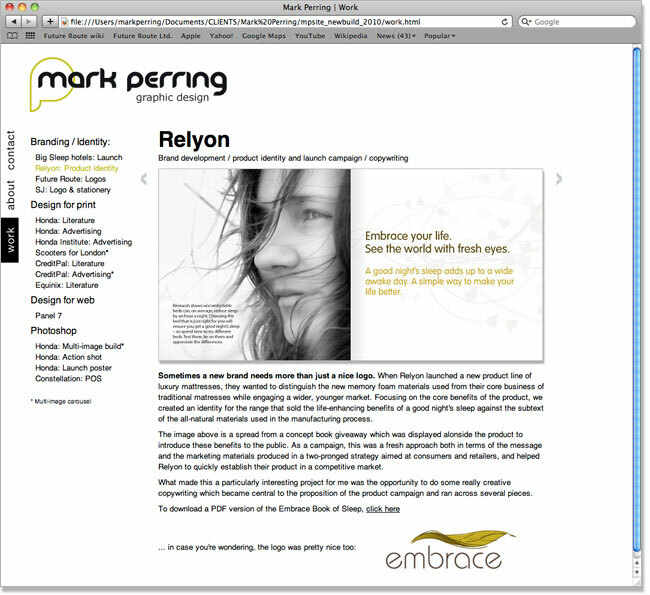 Shown above is a screenshot of the main portfolio page on the website. As this is also a showcase for the studio's web design services, there are a few more bells and whistles than I would normally include but everything is there for a reason and so far the response in terms of both feedback and customer enquiry rates has been very good. This was one of those great projects where I got to run most of it from concept through design, content and build. Click here to view the live site. A dynamic facelift and structural redesign for a website that unfortunately is no longer going live – I'm including this here because, although the job was cancelled, I'm really proud of the way it works. 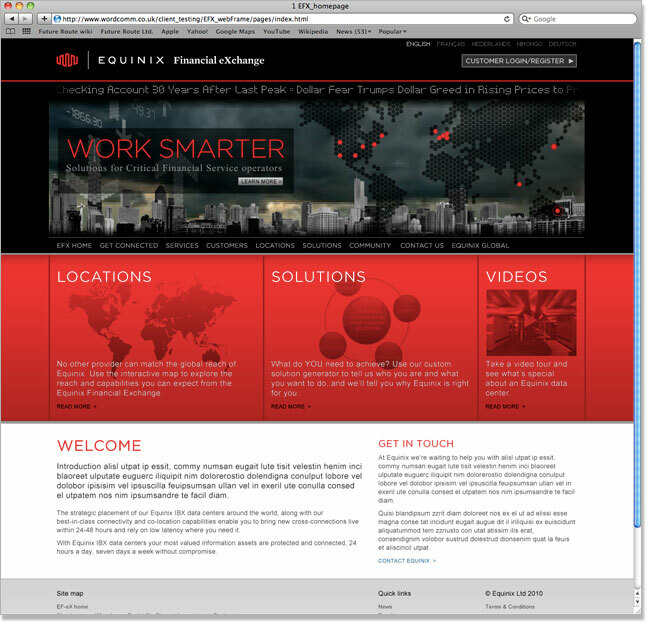 Developed as a rebuild of the existing website for Equinix's Financial eXchange, the screens shown here were built from sliced photoshop visuals for internal presentation. To aid in demonstration of the overall website concept, certian pathways were built 'live' into the model so that the user experience could be demonstrated. Eventually, the budget for the final build was pulled and incorporated to a global rebuild of the corporate websites was commissioned some months into the project – several points from this design are now being incorporated into this. 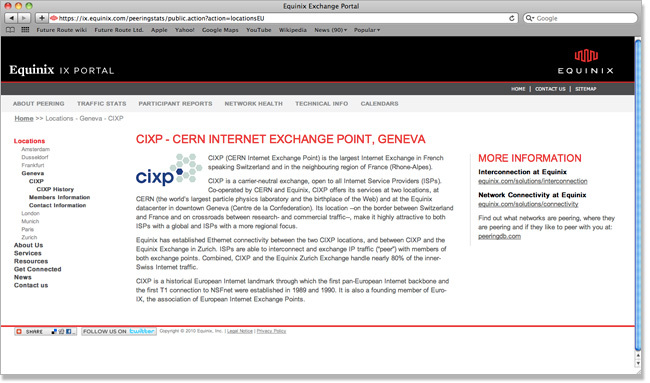 Restyling with CSS and content structure gave new life to this section of the Equinix IX Portal. Working within an existing Joomla website, we were tasked with updating the European sections to give a better user experience without breaking away from the main site's style. Taking my cue from the Equinix global website and brand guidelines for typographic treatment, I built an alternative page template with updated styles and improved column structure to break down the information within the page. Enhanced content is added through the use of subtle Flash effects in map-driven navigation elements and the inclusion of social networking bookmark links. The section navigation to the left of page is a new element which gives the user a simpler route to the information they need. This was an interesting challenge as a delicate touch was required to bring real benefits from the restyle without making the treated section appear separate from the rest of the website. As a continuation of my work on their recent rebrand this new website gives better access and a fresher face to the company's growing online presence. 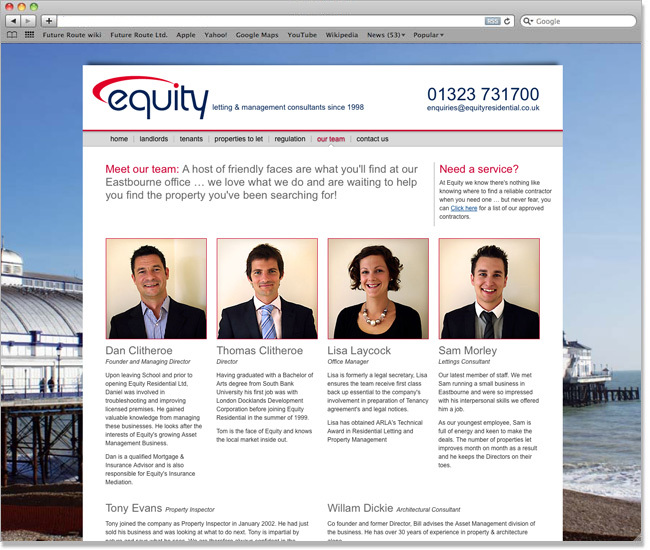 Here the clean lines of the Equity logo and brand style atre contained in the inner frame, contrasting to the 'softer' background location shots of their native Eastbourne, which load randomly on page refresh and hep to reinforce their image of a local, family-run business. This combination allowed me to deliver a website that holds a lot of text-heavy information without becoming dull, and that stands apart from the countless other estate agency sites on the web. I think it's worth putting this one in, as hopefully this website works as a showcase for some of the things I'm able to do. In particular, this portfolio section is a part of my self-learning jQuery implementation, something which I find I'm increasingly useing in recent online projects. The slider here is based on the Coda-slider by Niall Doherty, an open-source peice of code which I tweaked with a little jQuery and CSS. The rationale behind this website was to strip away everything but the essentials, to create a minimalistic, functional design that lets my work stand out. Hopefully you'll find it does a good job, any feedback is welcome. 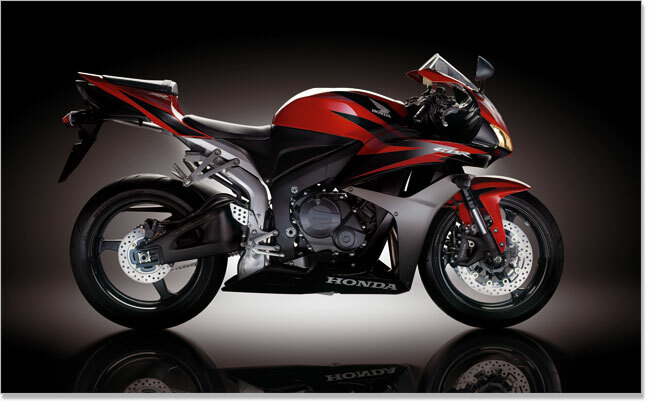 Designed primarily to appear on consecutive spreads, this photoshop composition illustrates the design changes and innovation under the skin of the CBR600RR. About a dozen individual studio shots were used to create these two images, brought together to illustrate each component of the bike in its best light and subtly manipulated to line up over one another. In the undressed version of the image, much of the semi-transparent bodywork was painted in by hand. The environment is entirely computer-generated. Getting a feel for the action is what this image is all about. Since the rise of 'Photoshop' in the public imagination it's often a dilemma as to how honest we should be with manipulated images. For this series, I developed a style which was christened "hyper-reality" – an obviously treated shot that stays true to its subject but aims to give a greater experience in terms of emotion. 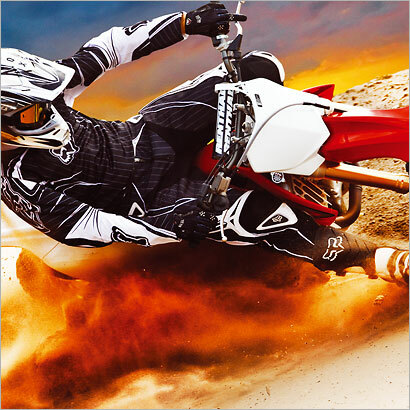 This shot was taken on an overcast day on a Belgian motocross circuit – the berm of the track is retained from the original shot while the far background is comped in and the dust-trail greatly expanded and stylised. The main work is in the colour treatment which pushes the image to give an impression of fire and speed. This was designed as a wraparound cover, with dead areas for logos and type built into the composition. 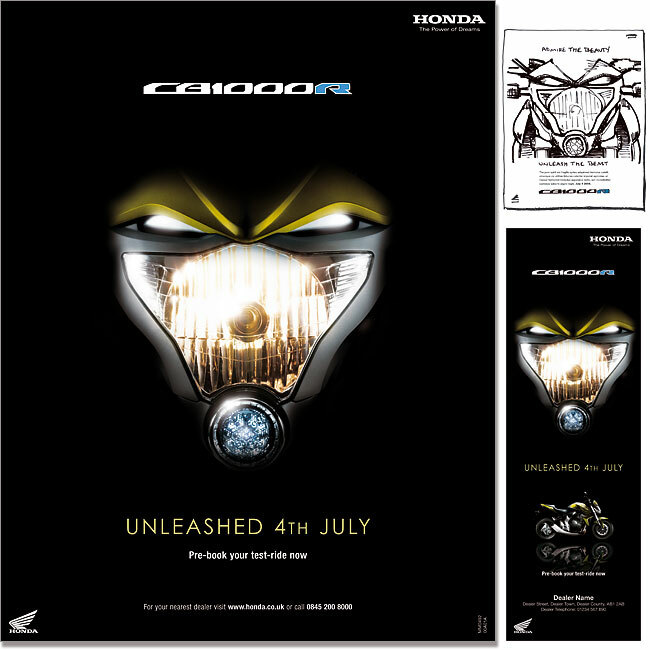 A brand-driven image composition for Honda, this example emphasises the design of the new bike and sets a very different stylistic tone while still keeping with the general brand style of the time. This was quite an important image as it was the main one used in the introduction of this new model to the world as Honda's flagship bike in this sector! 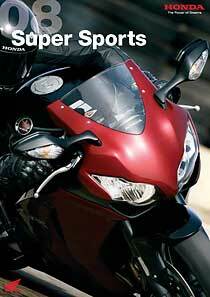 Used in the launch brochure, advertising and in-dealership large-format posters. This image is also fairly typical of the process in my composites – beginning with an overal concept for the identity of the product based on the brief etc. a shoot list was put together and sketched out where neccessary for the photo team. 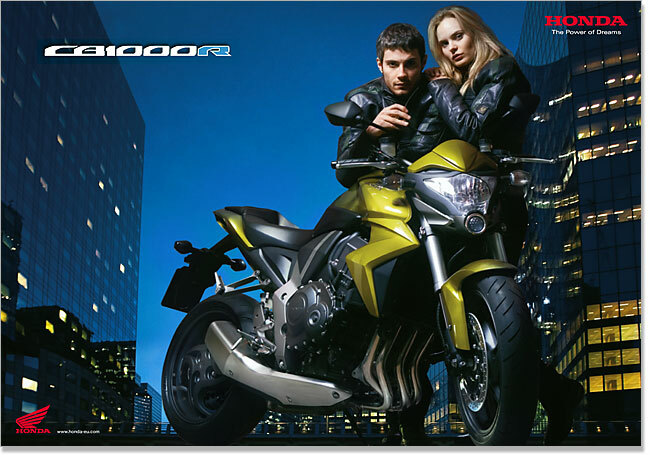 In this case the bike and models were shot in a studio while several location shots were taken along a theme based on general notes on building style, camera angles etc. I pick an environment that will fit the subject and then work to create the effect we are after. The ideas here were: young, fashion, high-gloss, cold/hot, urban, edgy, 'cool'. High-impact, colourful images were the order of the day for this product launch. Working from a base shot of the cadillac, the above image was worked into an assebled background of 6-7 separate shots then coloured to maximise visual impact. 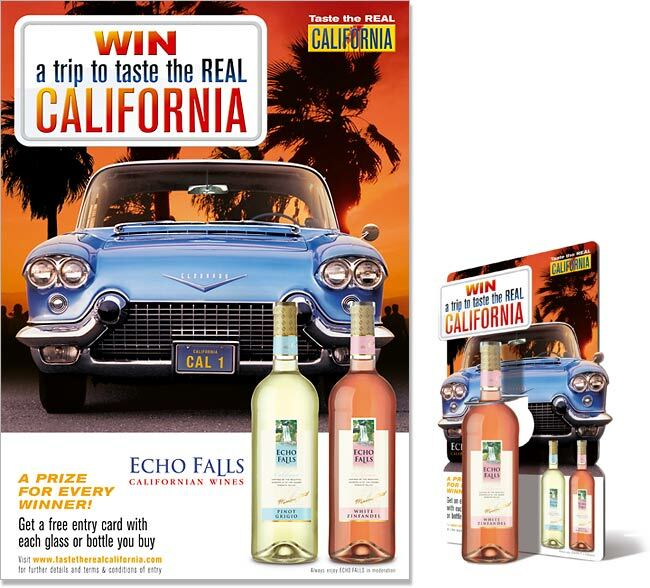 A range of collateral was created for each of the new wines, including posters, press advertisements, table-top boxes, leaflet dispensers with data catchers and tailored bottle glorifiers (shown above).